After my post on Ephraim Graecus here, I discovered that a modern edition of the whole collection exists, with a translation of all the works into modern Greek. This is Φραντζοᾶς, Ὁσιοῦ Ἐφραίμ τοῦ Σύρου, Thessaloniki, 1988-98, 7 vols. There is a website with a list of the contents by volume, and some mysterious-looking linked pages of text for each here. My initial efforts to locate this, even in printed form, initially drew blank because the editor’s name does not appear on the websites. 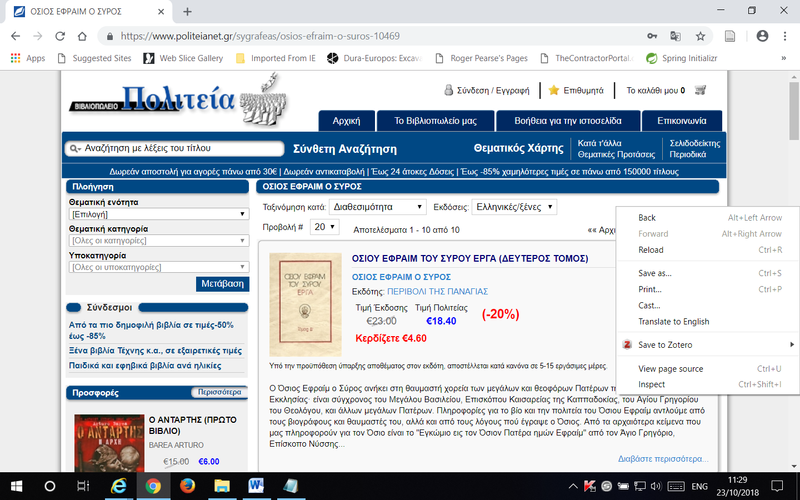 You have to search for the Greek title, which is ΟΣΙΟΥ ΕΦΡΑΙΜ ΤΟΥ ΣΥΡΟΥ. Searching for the editor name is futile. If you do want to find it, try Phrantsoles (!). I was luckier last night, and located a bookseller who had the volumes, in stock, and which played nice with Google Translate (just open in Chrome and right-click, and hit “Translate to English”. It’s here: https://www.politeianet.gr/sygrafeas/osios-efraim-o-suros-10469, Βιβλιοπωλείο Πολιτεία. I was able to create an account easily enough via the Google Translated form of the website, and no doubt could have ordered. 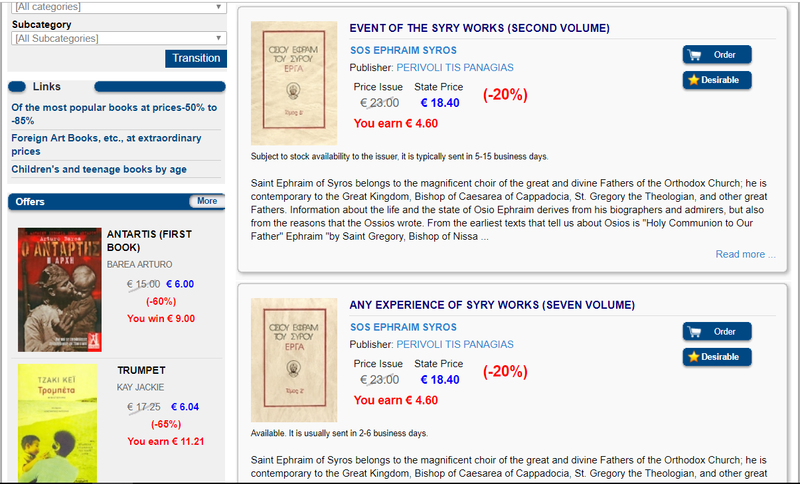 The seven volumes each cost about 18.40 euros. Unfortunately postage from Greece is as much again. I have not been able to locate any copies of these volumes in British libraries. No doubt some Greek Orthodox people have them. But the existence of these volumes means that anyone whose first language is modern Greek has an enormous advantage over the rest of us. It would be a tedious, but relatively straightforward business for such a person to prepare a summary of the contents of every work, in English and post it online. Such a step would instantly make the works far more accessible. There are quite a few people in patristics from a Greek Orthodox background. Would any of them care to undertake the challenge? There is more. Google Translate does not handle ancient Greek, for some reason. But it does handle modern Greek, as we have seen. I wonder what it would make of some of these texts? Thank you very much Ikkoki for your experience of Greek bookshops! That’s really useful. David, I’d forgotten the Hellenic lot. Thank you!